Dice the onion, garlic cloves and hot pepper, put them in a stew pot. Fry the contents of the pot with coconut oil until the onion and garlic have softened and turned golden. Chop up the sweet potato into 1cm cubes (this is the most difficult part of the recipe, I’d say. I wonder when I’m going to lose a finger or two while trying to cut through sweet potatoes – it’s always close to that catastrophe). 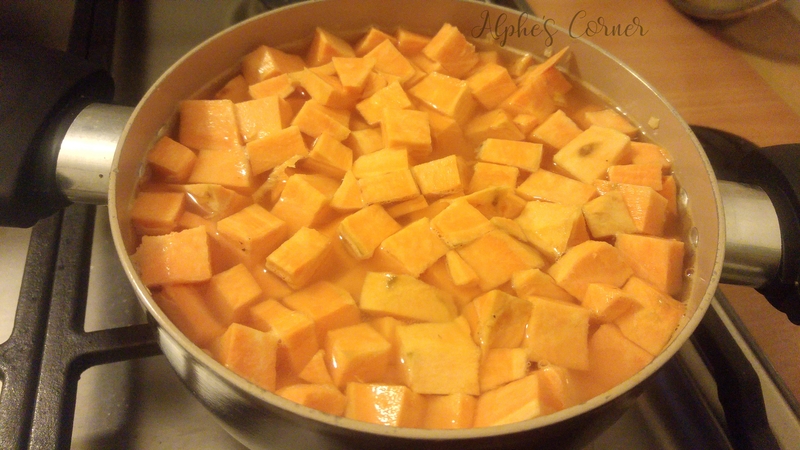 Add the sweet potato cubes to the pot. Add water to the pot, enough to cover the potato. Bring to simmer and cook for about 20 minutes, until you can easily mash the potato with a fork. With a fork, mash some of the potato chunks – just enough to add some texture to the sauce, don’t mash everything. Continue to cook until the sauce has thickened and isn’t too watery. Season to taste with salt, pepper, chili, cumin, turmeric, coriander and curry. Dissolve corn or potato starch in minimum amount of cold water (about 1cm water in a glass). Add to the pot while stirring the stew vigorously. Cook for an extra 5 minutes (the starch will thicken the sauce). Serve with rice cooked according to its instructions. 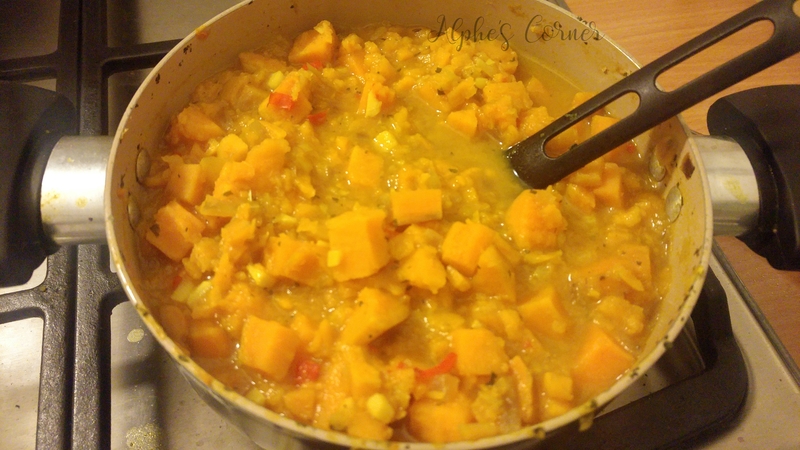 Cook it with a tablespoon of desiccated coconut added per rice serving for nice, oriental scent. 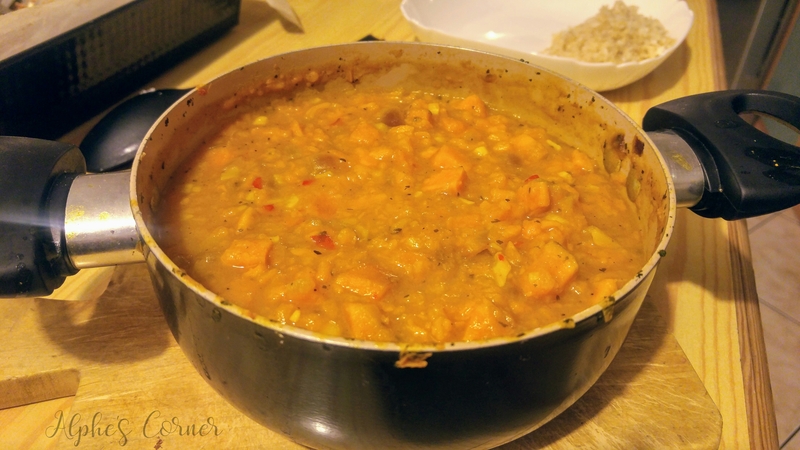 Spicy, warming sweet potato stew, perfect for cold winter days. Served with coconut-infused rice. 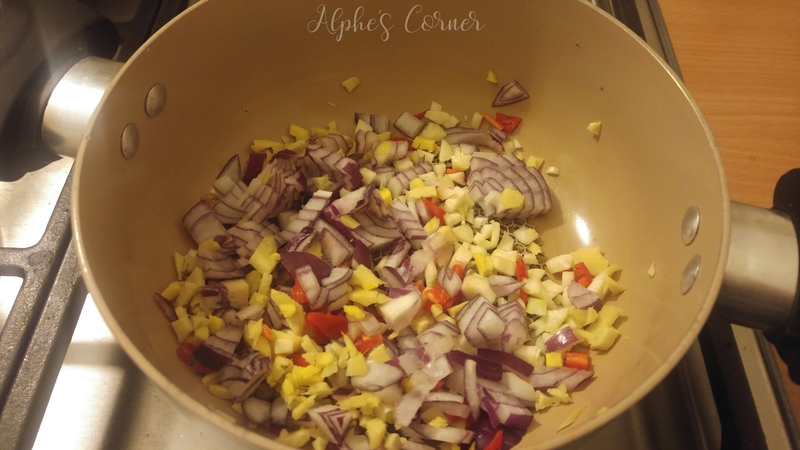 Dice the onion, garlic cloves and hot pepper, put them in a stew pot. Fry the contents of the pot with coconut oil until the onion and garlic have softened and turned golden. 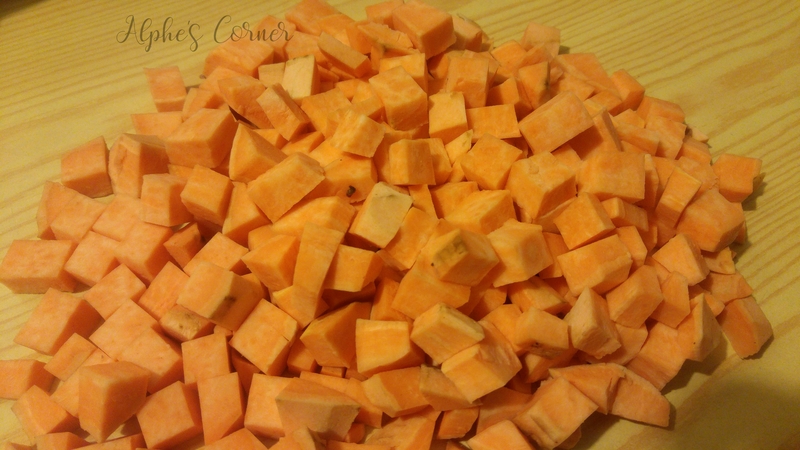 Chop up the sweet potato into 1cm cubes. Add them to the pot. Add water to the pot, enough to cover everything. Continue to cook until the sauce has thickened and isn’t too watery. Season to taste with salt, pepper, chili, cumin, turmeric, coriander and curry. Dissolve corn or potato starch in minimum amount of cold water (about 1cm water in a glass). Add to the pot while stirring the stew vigorously. Cook for an extra 5 minutes (the starch will thicken the sauce). Serve with rice cooked according to its instructions. Cook it with a tablespoon of desiccated coconut per rice serving for nice, oriental scent. why are sweet potatoes so hard to cut?!? 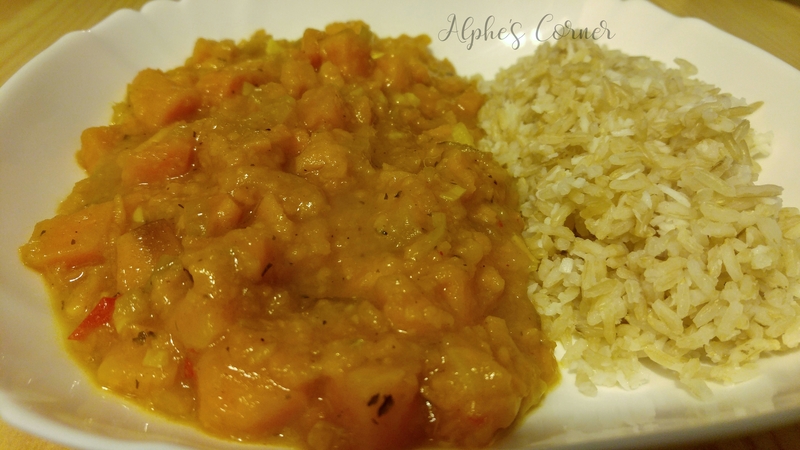 I also always worry I will slice off a finger…but this looks great and I have been wanting to try a sweet potato stew for a while. I know right?! They’re the ultimate nightmare to work with – the ‘avocado hand’ problem is nothing compared to sweet potatoes. Too bad they taste sooo good! Wow this looks so yummy. I love your snow photo as well! The snow is beautiful for a little bit. 🙂 The stew looks amazing! I have some sweet potatoes I need to use. This sounds like a good thing to do with them. 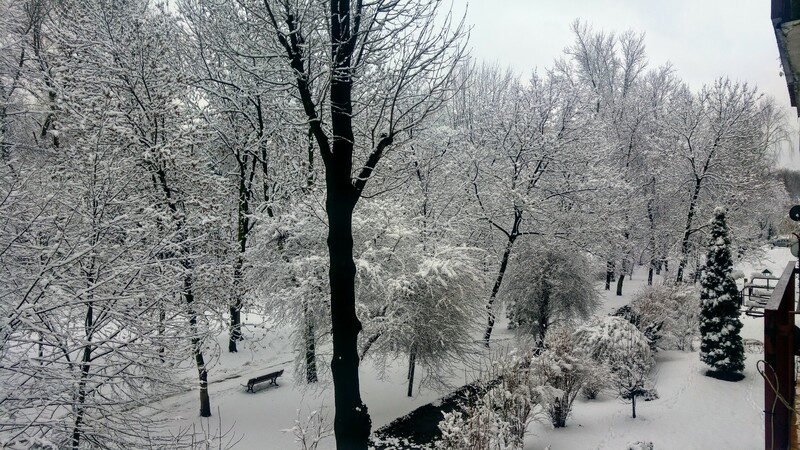 This comment just to say that here in Rome the snow is quite an event! 🙂 I really like snow, even though when you have to deal with it going around it can be quite annoying!